Business decision making is changing drastically. Are you leading the way or getting left behind? 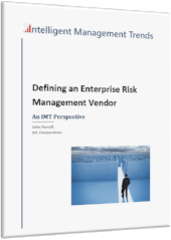 IMT provides market analysis of management trends and vendors improving business decision-making processes by integrating risk management principles, advanced technology, and burgeoning information resources to achieve organizational objectives. IMT offers market intelligence and custom market research services for enterprises, risk management solutions vendors, technology vendors, risk information providers, investors, and others seeking to implement and improve risk-aware business decision-making processes. For enterprises looking to build or improve risk-informed business decision making processes and systems to achieve organizational objectives. For vendors selling services, software, or information that enables risk-informed decision making in support of customer organizational objectives. 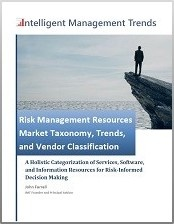 IMT’s industry trends research library offers market analysis of innovative management trends that meld enterprise risk management processes with organizational decision-making processes leveraging emerging technology, risk analytics, and risk information resources. Become part of the IMT community that discusses (1) business management trends, (2) how risk management best practices can better inform management decision making, and (3) the expanding service, software, and information vendor resources that enhance organizational decision-making processes. Our blog title urges the demise of business decision making based on static assumptions. Corporate objectives and decision making should be grounded in risk management principles bolstered by technology advances, real-time information sources, and analytics in today's dynamic business environment. Read our market insights and opinions on current management trends and vendors advancing the science of decision making in the pursuit of organizational objectives. Join your colleagues, IMT industry analysts, and IMT consultants online to discuss organizational decision making and risk management trends. IMT offers a wide range of custom research consulting services for vendors, enterprises, and others interested in advancing risk-informed business decision making. Reach out to us to discuss your organizational challenges and how together we can help advance risk management as part of organizational decision-making proficiency.